Get everything you need for a relaxing summer in one complete package! 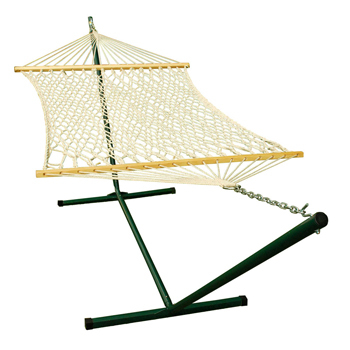 This combo from Algoma Net pairs a cotton rope hammock with a powder-coated green stand to bring you hours of enjoyment. Strong, comfortable and convenient for your indoor or outdoor pleasure. Cotton rope hammock bed 52 in x 76 in x 11 ft overall length.